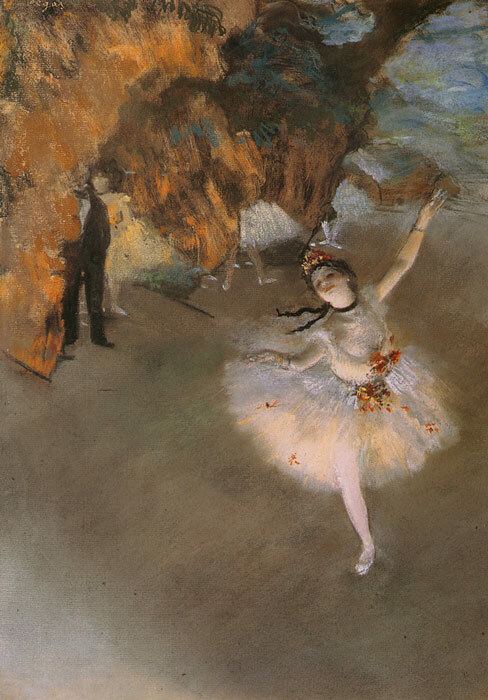 With a career that spanned roughly 50 years, Edgar Degas was among the group of innovators who ushered in a new era in art. Eschewing the subjects that were the mainstay of traditional painting, Degas focused instead on scenes of everyday life and became the first serious artist to depict the world of dance from unusual angles, specifically the ballets and ballerinas of the Paris Opéra, L'Etoile is a tipical example of this style.We have a selection of these paintings and you will learn more about his life and career. SPECIAL NOTE : The painter will make the reproduction as close to the original oil painting as possible. If you want your painting to alter from this likeness, please email us and " L'Etoile, c.1878 " will be reproduced according to your special requirements.